At the end of March, I received a lovely email from Lizzie Bailey who works at Gerald Bland Antiques (and who also went to school with Laurie Reynolds! Small world!) 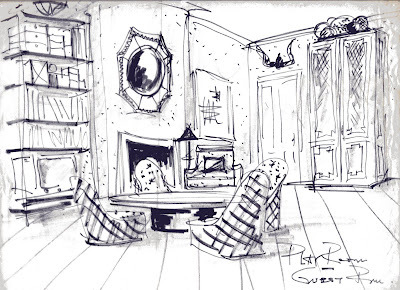 informing me that they would soon be selling drawings by interior design legend Albert Hadley to coincide with the Kips Bay Decorator Showhouse. Oh, and would I like to come in and preview them before they were sent to the framer? Would I?! I'm sure you can guess that I said yes! My friend Kevin had just asked me if I wanted to go check out the Parish-Hadley books that were for sale so I returned the favor by inviting him to check out the drawings with me. We spent almost an hour and a half in awe of what we were looking at and pouring over each one. Some are just signed and dated while others denote the client and house or project. 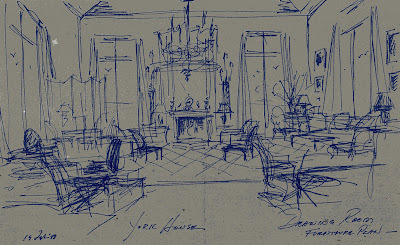 Some of those included in the sale include the initial sketch for the Astor Library on yellow ruled paper, rooms for The Duke and Duchess of York, The Paleys and even Carly Simon! We loved looking at how detailed some of them are even though they are just a sketch. Albert Hadley is amazing! 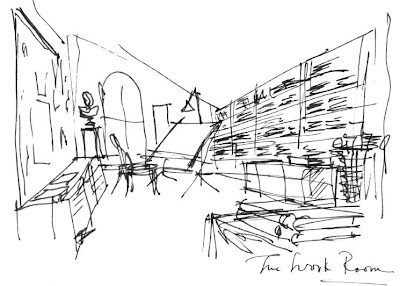 And what's also amazing is that his drawing of the "Office of an Executive Woman" (top) that he created while at Parsons is up for sale! While most are black and white drawings, there are a few beautiful color drawings that will probably be the most expensive items for sale. I'm not of the exact prices but the framed works will probably in the thousands while the unframed loose drawings should be under $1000. I've already put my name on one of them! Happy Birthday to me! 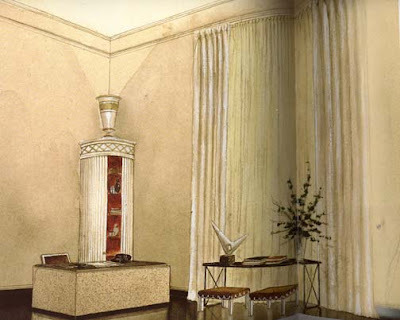 According to Lizzie, "The collaboration came about through Gerald Bland’s wife Mita Corsini Bland whose watercolor renderings will be featured in the forthcoming book Sister Parish Design: On Decorating by Susan Bartlett Crater and Libby Cameron. Due from St. Martin’s Press October 2009, the book includes a forward written by Mr. Hadley. When the authors, artist, and their husbands gathered over dinner this winter Mita asked Mr. Hadley if he still had all his sketches, which he did. Though initially Hadley wondered who would ever want to buy them, he did come around to the idea of offering his trove of drawings. Early feedback suggests that many people in fact are quite eager to own one!" I'd say so! 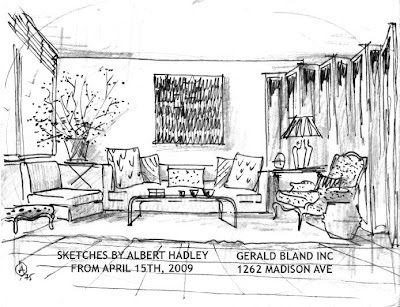 The drawings will be on display to the public at Gerald Bland Antiques beginning on Thursday, April 16, 2009.